So remind me why Fine Gael unceremoniously ousted Enda Kenny as party leader? Wasn't the point of the secretive internal coup and three weeks of leadership hustings to breathe new life into the party? Weren't we supposed to see a complete overhaul of Fine Gael the likes of which we'd never seen before? A new, reformed Fine Gael ready to take on the challenges faced in modern politics, which apparently Mr Kenny was unable to face down despite his four decades in the Dáil. During the leadership hustings, which you probably didn't watch because they were streamed to almost nobody on Facebook, Leo Varadkar promised a bright new dawn for Fine Gael. He said his leadership would herald a new era for the party - politics would never be the same again. He would unveil policies and election strategies which would make your jaw drop. The opposition would crumble in fear as Fine Gaelers pounded the pavements during campaigns. 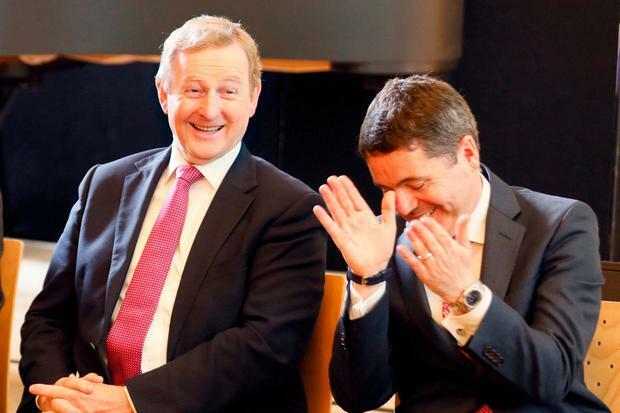 All Fine Gael had to do was say cheerio to Enda, make sure they didn't vote for Simon Coveney (actually, most of them did but never mind) and elect Mr Varadkar as party leader. Well, they did that. They put him in charge and yesterday was his first challenge as not only leader of Fine Gael but as leader of our country. Mr Varadkar had weeks, if not months, to think about how he would shape his Cabinet to reflect his reforming vision for the future of politics. And what did he do? Feck all. When his ministers posed for their official photograph beside President Michael D Higgins in Áras an Uachtaráin last night you had to squint to spot changes from the same picture taken around the same time last year. Mr Kenny was noticeably absent from the photograph, as was former finance minister Michael Noonan, but apart from that the changes were cosmetic at best. In fact, if you replaced the Independents in the photograph with a few Labour Party TDs it would look pretty much the same as Mr Kenny's first cabinet. Most of the Fine Gael ministers appointed yesterday are in their third, if not fourth Cabinet. The only new faces were Eoghan Murphy, who got promoted from a junior ministry in the Department of Finance, Minister of State Michael Ring, and Joe McHugh, who was also a junior minister in Foreign Affairs. Everyone else was appointed by the former Fine Gael leader either last year or over the previous five years. This is Mr Kenny's cabinet with Mr Varadkar at the helm. Yes, people are doing different things but what's the point in moving ministers a year after they've been in a department and only just got a handle of their brief. Essentially, Mr Varadkar reappointed Mr Kenny's entire cabinet in return for their votes during the leadership election. Only Simon Harris, who is to remain Health Minister, dared to risk his job by siding with Mr Coveney. But his ministerial skills ensured he didn't lose his portfolio. Even Mary Mitchell O'Connor, who has faced sustained criticism for her handling of the Jobs portfolio, was not dropped. Instead, she was demoted with the sweetener of a newly and pointlessly created super junior ministry in the Department of Education. Mr Varadkar's vote-bagging exercise is sure to infuriate Fine Gael colleagues in Leinster House once the reality of his 'new' Cabinet sets in. However, Mr Kenny and Mr Noonan will take a well-earned break over the coming months safe in the knowledge that little will change while they are away.